President Romney – whose brilliant strategy to ride to the White House by writing off 47 percent of the population fell...er...short of the mark – has handed down the sacred tablets of judgment as to who is and who is not fit even to run, let alone be elected, President of these United States. Here is a man whose own Romneycare plan for "health" made laughable his 2012 effort to portray himself as a leading light against Obamacare's overly-grabby quest for power. He now scolds a 2016 candidate to live up to the high, high Romney standard of how to win. Here is a man who talked like a Massachusetts liberal when he was – well, a Massachusetts liberal governor, no less. President Romney was all over the lot on several social issues, depending on the geography of his audience. President Romney follows a long list of predecessors who have shown us the path of wisdom through their tenure as keepers of the establishment flame. We write here of President Willkie, President Dewey, President Rockefeller, President Stassen, President Ford (occupied the White House, but never elected to it), President Dole, and President McCain. All of them, in one way or another, were encouraged or promoted by powerful forces that had interests against "rocking the boat." It started during the New Deal days when the Republican Party was relieved of its nearly 70 years of political dominance. Following that, the GOP developed an inferiority complex. 1 – conclude that any conservative on a Republican national ticket was a political death knell, and therefore 2 – all GOP presidential candidate efforts henceforth would be to give conservatives the rhetoric, while giving party liberals the "me too" action. The Romney penchant for encouraging civil war within the Republican Party seems historically to run in the family. 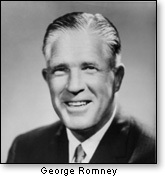 Back in 1963, Governor George Romney of Michigan made a political call to Salt Lake City, a location in which the then-president of American Motors had some roots. He was there as a Republican to denounce, with no small amount of invective, one of the party's presidential hopefuls for 1964: Senator Barry Goldwater. The senior Romney went after the Arizona senator with a tone of anger, making it plain without saying so that if the latter were nominated, Republicans could not be blamed for sitting out that year's general election. More recently, a younger Romney generation has appeared on the scene. This Romney – Mitt – actually fulfilled his father's dream of running for the presidency and winning the nomination. The younger Romney, then governor of Massachusetts, said a lot of the right things – sometimes seemingly depending on what day of the week it was. 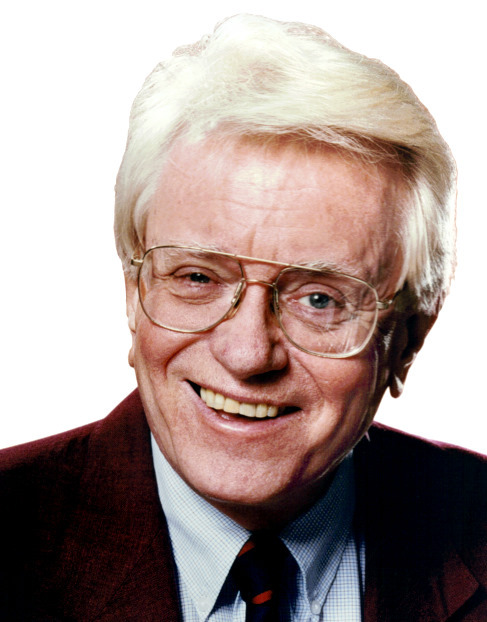 He was widely given the richly-deserved name "flip-flopper." 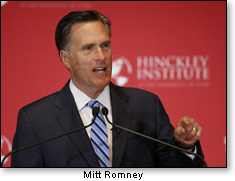 But at least, unlike his father, Mitt's rhetoric was accompanied by a softer tone and a friendly smile. Mitt Romney in 2012 won the first of three debates with Barack Obama, but then after that victory, he was under pressure by establishment media and their acolytes not to be so tough on Barack Obama, then seeking a second term of his ruinous regime, and to show more respect for the man who, after all, occupied an exalted position. Mitt caved and toned it down in the next debates, with predictable losing results. So in 2016, not content with wrecking his own campaign in 2012, this Romney is back at the same old family stands slamming a candidate for the Republican nomination with vilification – falsely accusing Donald Trump of tolerating the KKK and racist David Duke when, in fact, he had repeatedly disavowed that discredited figure. Like his father, who knew Barry Goldwater did not have a race-hating bone in his body, so too – all these years later – did Mitt Romney know that his false name-calling accusations will make the uphill climb for the party in November all the more difficult. Some fear he has guaranteed defeat in November. Since finishing his one term as governor of Massachusetts, and having made the unsuccessful run for president, Mitt Romney has moved to Utah – again, here is where his family has deep roots. No sooner did he arrive in the state than he joined a movement to make it harder for the people of Utah to control their voting process from the grassroots. For decades, going all the way back before my own times in Utah – in the fifties and again in the sixties – Utah has had one of the most democratic (with a small "d") nominating systems in the country, even going as far back as my parents' growing-up days there. The political season would start with meetings in people's homes where they would elect delegates to their respective party conventions, at which they would then vote on candidates for governor, U.S. senate, Congress, and other high offices. Many office-seekers availed themselves of this opportunity to get involved at the grassroots. The top two candidates seeking each office would be on the ticket for the primary, making it more difficult to play the mischievous game of "divide and conquer." In 2010, the "powers that be" were shocked when incumbent Republican U.S. Senator Bob Bennett was defeated in the primary by (now-Senator) Mike Lee. Since then, the state establishment has created a vehicle by which they intended to change the system in such a way as to bypass or render much weaker the state conventions. They created a well-financed group cynically named "Count my Vote," which Mitt Romney joined in a well-publicized way. Of course, the tried and true decades-long system did not fail to "count" anyone's vote. It's just that its method of providing maximum input for the average Joe or Jane was getting in the way of the moneyed interests seeking to bankroll the process by going straight to the primaries without that bothersome grassroots "nonsense" from the plebeians. I am not and have not been a Trump supporter in the primaries. This column has praised the New York builder for his willingness to kick over the cozy little precincts of those powers that presume the right to pick the party's candidates on the basis of "it's his turn." I have stated that Trump's quest for the presidency, as far as I was concerned, was another issue, even though of course he views his independence from establishment politics as a stepping-stone. This column has endorsed no one in the primaries, and won't until the proverbial "dust settles." Mitt Romney says he may endorse a candidate after March 15. At least that's enough of a fair warning for those remaining candidates who may wish to duck and hide. Nothing is so valueless as the "kiss of death."